Courtesy of adam p. schneider Seersucker seems to be working out well for Adam P. Schneider. Now that Easter has come and gone, it’s seersucker season. And for some, seersucker represents the worst of Harvard: haughty attitude and old boys’ (read: final) clubs. For others, it’s a sign of spring and of garden parties. For me, it represents neither and that’s probably why I like it. I bought my first and only seersucker blazer in Canada at a thrift shop on summer break after freshman year. It was in mint condition, the right size, and the perfect price ($10). Canada is an odd locale for seersucker suits, and even after attending high school there, I have yet to see any of it worn on the shores of British Columbia. Thus, the blazer has come to represent a poetic irony that is reflective of my Harvard experience. Like my blazer, seersucker itself has an ironic history. Originating in India, the word “seersucker” comes from the Hindi, Urdu, and Persian words “shir o shakar,” meaning “milk and sugar.” Not exactly the first thing to come to mind when one is drinking a Mint Julep. In the United States, seersucker was first worn by the working class in the South and then was later adopted by the upper classes, becoming a staple of the Southern Gentleman in the hot months of May through September. For me, seersucker is all about contradictions, embracing tradition, and forging one’s own path. Harvard, after all, is an institution that is filled with brilliance—and also stupidity. During my freshman year, I helped to write an article for this magazine called “The Cult of Yale,” whose cover bore the headline “Hating Harvard: Should we all have just gone to Yale?” The article enraged a lot of my friends, who told me I was a bitter freshman without any school spirit. But the article’s publication meant something more than that: it meant that I could take a look my school, tear it apart, and still wholeheartedly love it. I have had “fun” in these past four years. Perspective is hard to come by at Harvard. The student body is chock full of perpetual overachievers with high standards for almost every aspect of their lives. And so, much like the origins of seersucker, I have found that finding happiness at Harvard often means having to say goodbye. Leaving Harvard to study abroad was perhaps the single best decision of my undergraduate career. Not only did going to France give me a better grasp of the French language and culture—replete with champagne and encounters with the French police—but also it gave me an appreciation for Harvard that I would not have experienced otherwise. I missed the intellectual vigor, the faculty, house life, and most of all my friends back in Cambridge. One doesn’t have to study abroad, however, to gain perspective or experience the fun offered outside Harvard’s gates. Taking weekend trips has been as much a part of my college experience as the dorm parties and Harvard Square bars that I’ve stumbled home from on too many nights. Although my roommates might occasionally say that I’m hardly a student here, I’ve never had a regret about a single weekend spent in New York, in Montreal, or even in Charlottesville, Va.—the perfect locale for showing off my seersucker. 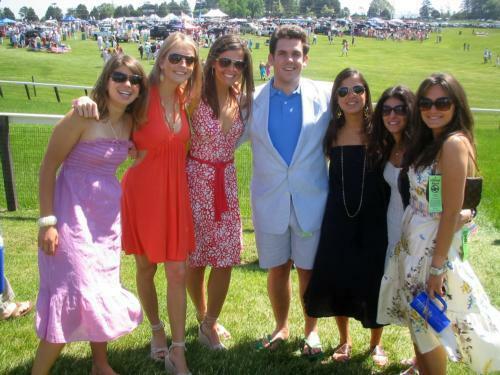 Last year, I visited a close friend from high school at the University of Virginia for the annual Foxfield’s horse race. Shortly after arriving in Charlottesville, I was concerned that my seersucker blazer might not be enough to brave this event, heralded by my friend as the “preppiest event you will ever experience.” And so to complete my look, we went shopping at the nearest J.Crew. Twenty minutes later, I had a pair of seersucker shorts perfectly swatched to my thrift-store blazer. Over the course of the weekend, I got to see real college “fun”—the kind where frat boys are kings of the universe and “Animal House” seems to be a bit of an understatement. I loved it: drinking games, boat shoes, madras jackets, sundresses. It was all so idyllic. But, it wasn’t Harvard. Despite regretting having to board a train to Boston at the end of the weekend, for me, there was something missing under my seersucker blazer. Beneath my beer stained polo shirt was, and is, the heart of a guy who never wanted college to be a perfectly packaged social experience. So what if Harvard tends to be that awkward, nerdy cousin, who seems more comfortable quoting Foucault than crushing beer cans. Give him a chance. I promise that with a little seersucker and a mint julep in hand, you’ll hardly recognize him.